Mauricio is a veterinarian and a Fulbright fellow from Chile. 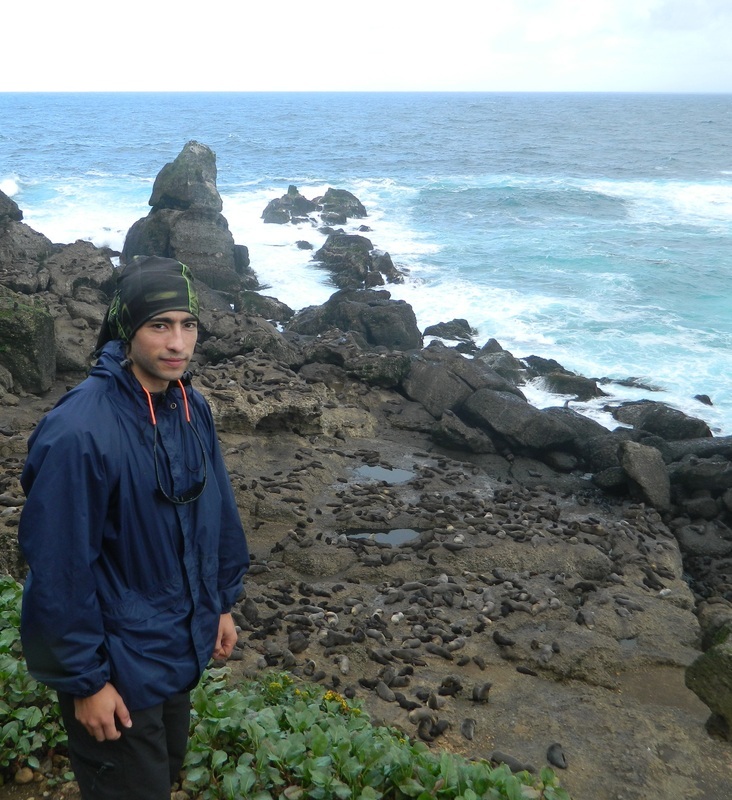 Mauricio studies the pathology and ecology of diseases of marine mammals and other wildlife species . His research interests include pathology of marine mammals, seabirds and invasive species. The goal is try to understand the host-pathogen relationship and effects that pathogens can have in different species and environmental conditions. This information is crucial to address the effects that human induced changes of landscapes, including spread of invasive species, have on wildlife, ecosystem and human health. 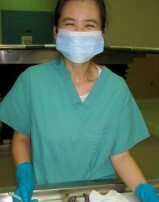 Liae is a veterinarian from Korea, and received her PhD Pathology in 2016. She investigated the effects of urbanization on the ecology of wildlife diseases. She studies raccoon and feral cat populations from urbanized and natural habitats in the Southeastern US. Her goal is to explain how altered ecology of non-domestic animals in urban environments promote cross-species pathogen transmission and modify the genetic population structure of these pathogens. 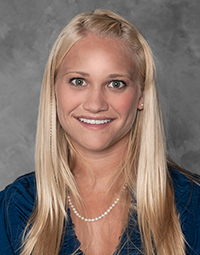 Annie Page-Karjian, DVM, PhDAnnie is a veterinarian and received her PhD in Veterinary Pathology from UGA in May 2015. 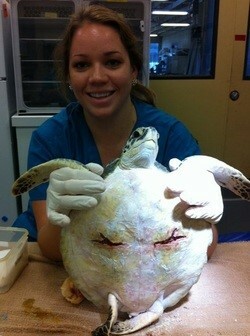 Annie studies the epidemiology and pathogenesis of infectious diseases of sea turtles. 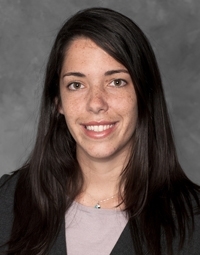 Her current research addresses fundamental questions on characteristics of subclinical infection, latency and transmission in chelonid fibropapilloma-associated herpesvirus infection, the likely etiologic agent of sea turtle fibropapillomatosis. This research is a suitable continuation of the graduate work she has completed thus far, which includes investigating sea turtle fibropapillomatosis using advanced diagnostic techniques; implementing comparative transcriptomics in an economically important shellfish pathogen; and conducting a retrospective case series analysis of sea turtle fibropapillomatosis in rehabilitating sea turtles. Ming received her MS in our laboratory in August 2012. She studied relationships between community poverty level, domestic dog health status, and parasitic infections of domestic dogs in rural Panama. Ming is now an ORISE fellow working in the Department of Vector Borne and Zoonotic diseases at the CDC. 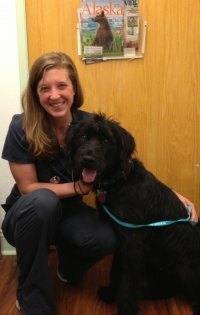 ​Steffi is a DVM student at the Virginia-Maryland College of Veterinary Medicine. She received her BS in Biology from the University of Virginia. Her research interests are in parasitology and pathology. Steffi is working on an interdisciplinary project with the Department of Anthropology at UGA and the Gorgas Institute of Health Studies in Panama. The project studies socio-cultural drivers and anthropogenic landscape change to understand how these factors are linked to an increased risk of vector-borne diseases in humans and domestic animals. Her specific project will focus on Leishmania (Vianna) panamensis detection in canines through biochemical assay. Carmen is a DVM student at St. George's University. She was a UGA Veterinary Scholar in the summer of 2014. She used molecular diagnostics to investigate the presence of chelonid fibropapilloma-associated herpesvirus in the natural environment of green sea turtles. 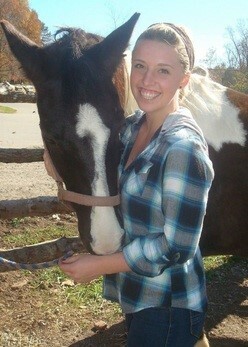 Heather is a DVM student at UGA. She was a GA Merial Veterinary Scholar in the Summer of 2012 who did her research project on effects of urbanization on patterns of bloodborne pathogen coinfection in raccoons. Rachel is a DVM student from the University of Tennessee who was a Merial Scholar in our lab in 2011. She studied effects of urbanization on helminth communities in raccoons. Maggie Trefney was a DVM student from Kansas State University and a Merial Scholar in our lab in 2010. 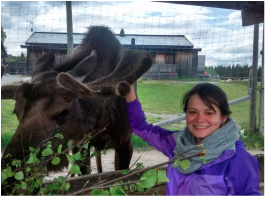 Maggie is now a veterinarian and is working at VCA East Anchorage Animal Hospital in beautiful Alaska! Karen is now a vet student at UGA and a recent Georgia Veterinary Scholar in the lab of Dr. Sonia Hernandez!! Jason is currently a sophomore undergraduate at the University of California, Berkeley majoring in Molecular Environmental Biology with an emphasis on Environment and Human Health and minoring in Global Poverty and Practice. He grew up in Temple City, CA and when he is not studying for school, he plays basketball, works at a bubble tea store, or spends time by the ocean to relax. 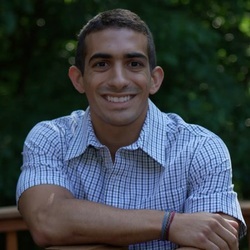 In the summer of 2018, he was fortunate enough to have been able to work on a research project with Dr. Nicole Gottdenker and Cristina Pilar Varian which allowed him to explore his academic interests in environmental biology and how it can be applied to uphold human health in poor, rural communities. Alexandra is a third year biology student from EAFIT University which is located in Medellin, Colombia. She was participated in different projects investigating: bird reproductive ecology, ectoparasites in avifaune, fungus biochemistry, altitudinal gradient of bryophytes and mosquito development in different localities in Colombia. From August to January she will do an internship based on the Chagas disease under mentor Dr. Nicole Gottdenker. 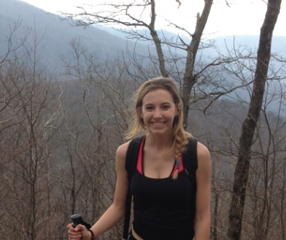 ​Victoria is a fourth year biology major at Kennesaw State University. 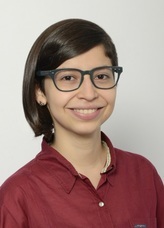 Her research will be conducted under Maurico Seguel during summer 2016. She will look at the immune response to hookworms in South American Fur Seals and how the limited variations in the species immune system genes leave them susceptible to hookworm infection. After graduation, Victoria plans to continue her education in the fields of infectious and zoonotic diseases. 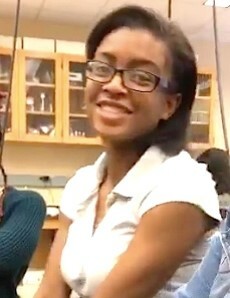 Anaija is a third year biology major at Spelman College located in Atlanta, Georgia. For the summer of 2016, she will base her research on the Chagas disease and the nymph stages of the Rhodnius triatomine specie under mentors Dr. Nicole Gottdenker and PhD candidate Christina Varian. 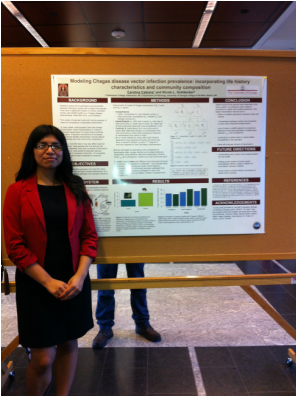 Carolina was our NSF REU student for the Population Biology of Infectious Disease Program. Carolina modeled impacts of variations in reservoir host immunity on Chagas disease transmission. Ali Anderson is a third year CURO Honors Scholar, studying Biology and Nonprofit Managment. This semester, she is learning basic lab techniques in PCR and GSI Mapping with an eventual goal of pursuing an independent project on tick borne illnesses. 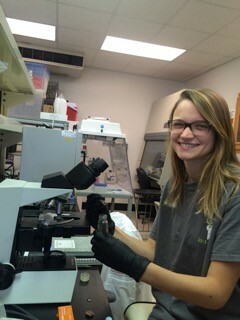 ​​Jordyn Whitfield, a University of Georgia Honors Student majoring in Biology and Genetics, spent Spring 2015 semester working in our lab through the UGA CURO Program. Jordyn assisted Dr. Page-Karjian with her sea turtle virology research, and she presented her research at the 2015 University of Georgia CURO Symposium. ​Ronke is a pre-med Genetics and Spanish major in the Honors Program. 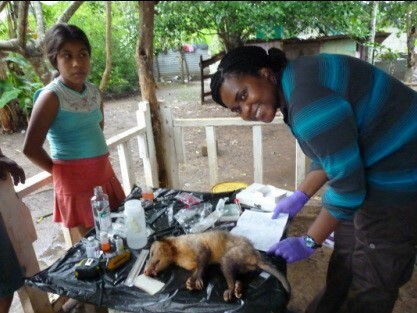 Ronke studied the ecology of Trypanosoma cruzi infection in opossums in Panama for her CURO fellowship in 2012. She is currently working with us on next-generation sequencing of blood meals in kissing bugs. After graduating UGA and working at the NIH for over a year, Ronke will be attending Georgia Regents University Medical School in Athens GA in the Fall of 2015!!! Natalie Wynn is a fourth-year biology major at UGA. In the summer of 2015, she studied the connection between Panamanian insect food web dynamics and anthropogenic land use with Christina Varian. In Natalie's last two semesters at UGA, she plans to further research Chagas disease vector Rhodnius pallescens and the relationship between their Trypanosoma cruzi infection prevalence and community structure. Susan Brands is a third year Honors student studying biology with pre-medicine intentions. This spring she will be examining field-collected dog blood samples by slide examination, PCR, and antibody testing. She will be looking for the presence of trypanosome infections as well as leishmania infections, and she plans to write a research article relating the prevalence of these infections in domestic dogs located across a land use gradient varying in levels of deforestation. Celia is a senior double major in Biology and English Literature at UGA. 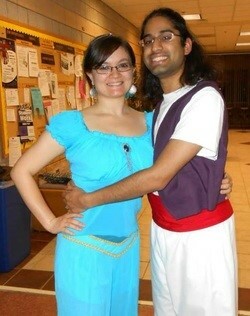 She received her undergraduate degree in December of 2012, and we wish her well, and miss her very much! Celia is now a certified Medical Technologist and working full-time at Emory Hospital's Clinical Flow Cytometry lab. Mark worked with us on molecular identification of Rhodnius pallescens pathogens. Mark received his BS in Ecology in 2010 and is now an environmental consultant in California.